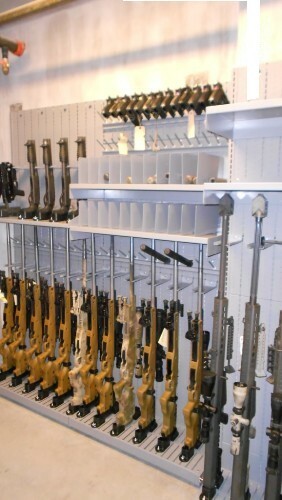 Combat Weapon Shelving Systems store all past, present and future weapon systems including rifles & shotguns, crew-served weapons, mortars, machine guns, miniguns, sniper rifles, pistols and tasers. 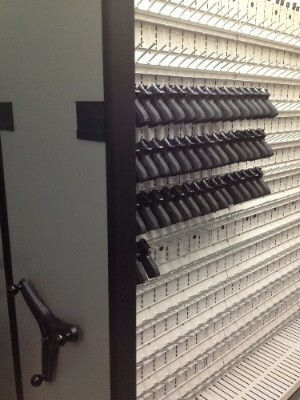 Our modular fully slotted back panel system design allow for optics to be stored attached to weapons and rapid reconfiguration of individual components to meet a changing inventory. 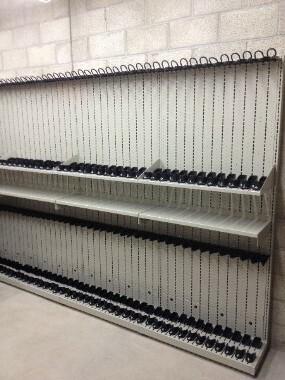 Combat Weapon Shelving single & double sided sections are available in single sections or can be connected as starter-adder configurations for multiple sections or high density shelving applications. 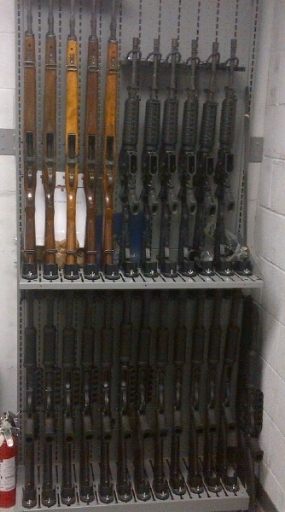 Combat Weapon Shelving sections are easy to assemble using our post and panel system with anchors available to bolt the system to the floor and wall. Rugged, reinforced back panels with heavy gauge steel provides rigidity required to store all weapons and gear. Components include Combat barrel saddles, Combat Weapon Holders, spare barrel supports, pistol pegs & pistol cradles, various width adjustable shelves and bins for multiple gear storage requirements. All components can be configured individually for independent adjustability inside the weapon rack, offering the maximum eficiency, adaptability and storage capacity in a small footprint. 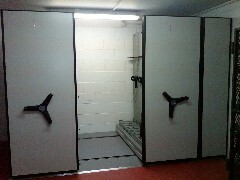 We also offer hand gun lockers for individual security requirements. 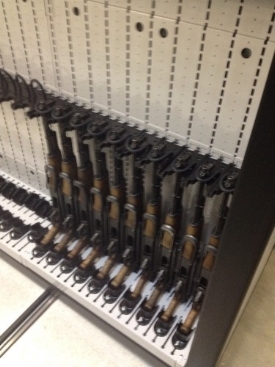 We like to emphasize full weapon rack modularity with internal weapon rack components using individually adjustable barrel saddles as opposed to fixed height or shared barrel saddles. 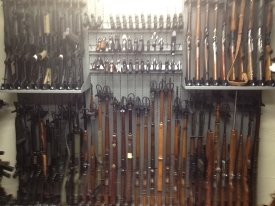 Combat Weapon Storage Systems are available as stand-alone fixed storage systems or as high density storage systems mounted to moveable carriages for a compact shelving system. Our background as storage system experts allow our system designers to implement the most efficient, space effective armory design available. Heights: 50", 66", 78", 84"
Depths: Single: 15.2", Double: 27.9"
All products and services are available on GSA Schedule to the US Federal Government applications. 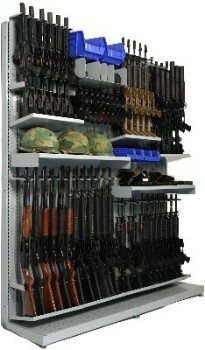 Combat Weapon Shelving configured as a double sided unit with two tiers of Shotguns on the front and two tiers of M16s on the other side of the system. 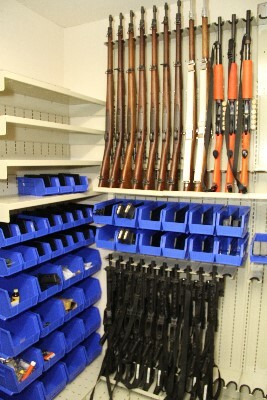 Store weapons and gear with Combat Weapon Shelving Systems. 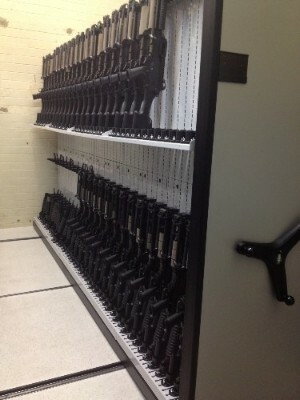 Combat Weapon Shelving on mobile carriages for a high density weapon storage installation. Vital Valt 2005-2018© All rights reserved.